While Governor Kasich has not yet had his final shot at Amended Substitute House Bill 59 (130th General Assembly), also known as the Biennial Budget, I think it's pretty safe to assume that he'll not use his Line Item Veto power to make any significant changes to the funding of Ohio's K-12 schools. 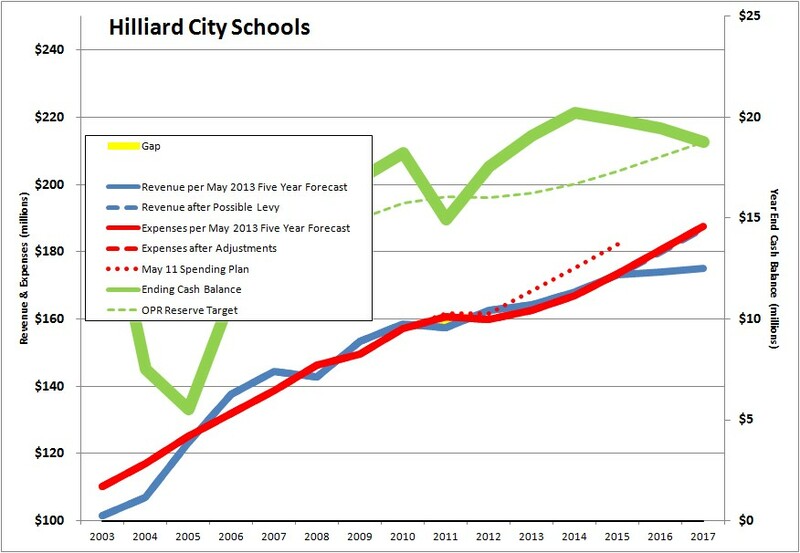 This budget is good news for Hilliard City Schools. After years of flat or diminishing state funding, the lawmakers have seen fit to recognize that our state funding has not reflected the rising state income tax contributions made by the people and businesses of our community, nor the growth in students served by our district. The Ohio School Boards Association this week released a spreadsheet showing how the state funding would change, district by district, in the new budget. It shows that for FY13 - the fiscal year just ending - our state funding should end up at about $34.7 million. Then in FY14, it would increase $2.2 million to $36.9 million. Another $3.9 million is to be added in FY15, bringing the state funding that year to $40.7 million (all numbers rounded to nearest 0.1 million). 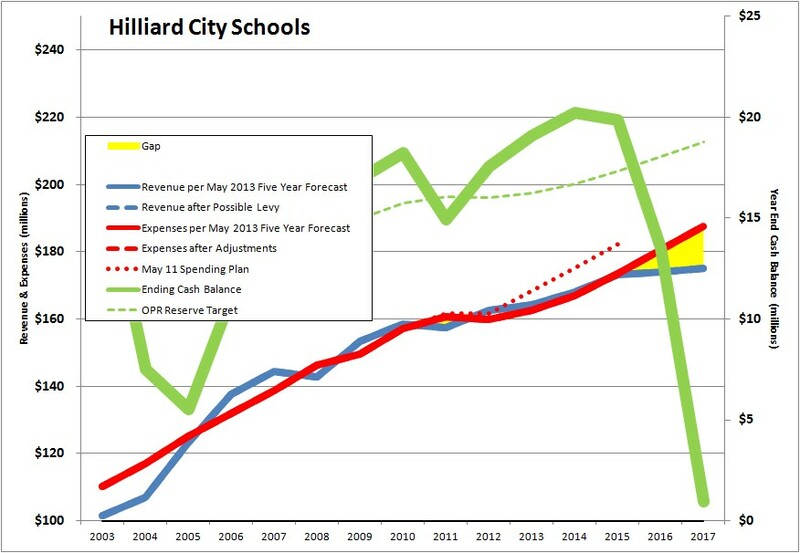 According to this forecast, our cash reserves would be exhausted in FY16, and it was my estimate that we would need to pass in 2014 a levy of approximately 6.4 mills (costing us about $200/yr per $100,000 of market value) to keep our cash reserves at 10% of operating expenses, as set by Policy DBDA. I know those two charts look almost the same, but please note that the righthand axis has shifted substantially. With the increase in state funding, the depletion of cash reserves is delayed by a year. So what choices might we make? 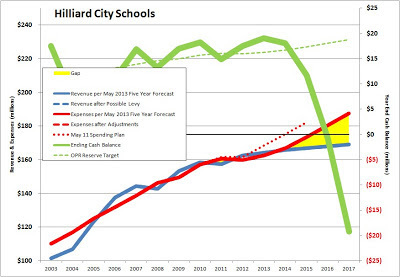 When the Board considered the updated forecast in May, using a not-so-rosy state funding forecast, I suggested that we cut our rate of spending growth from 4%/yr to about 3.7%/yr in order to reduce the size of the levy it looked like we would need in 2014. What if we made this reduction in the spending rate growth anyway, even with all this new money from the State? I think we still would need to put a levy on the ballot in 2015, but it could be 4 mills instead of 5 mills. Before we go any further in this analysis, remember that another change that came with this new Biennial Budget: the elimination of the 12.5% property tax rollback, and the equivalent reimbursement by the State. With the rollbacks in place, a 4 mill levy would cause local property owners to pay about $123/yr additional per $100,000 of property value. With the rollbacks eliminated, local property owners would pay $140/yr additional per $100,000 of property value. This doesn't change the amount of money the school district gets, it just makes the local property owners pay the whole 4 mills. What if we went ahead and put a levy on the ballot next year, and kept the spending growth rate per the current Forecast? That would allow us to reduce the rate to 3 mills, or $105/yr additional per $100k. What if we did a 2014 levy, and cut the spending growth rate to 3.7%? Then we could get by with 2.4 mills, or $84/yr additional per $100k. And there are some in our community who would advocate for going ahead and putting a 5 or 6 mill levy on the ballot in 2014, and using the additional funding from the state to increase our rate of spending growth. This certainly isn't my viewpoint, but we need to respectfully listen to those who might feel this way. The point is that we have lots of options, just as we did two years ago when I wrote about our Budget Knobs. I hope that this topic is a significant part of the discussion during our Board retreat in the Fall. And this would be a great time for the voters to speak their mind. We'll represent you better as Board members if we know what direction you want us to take. Comment here, send us emails, write letters, give us a phone call, or speak at a Board meeting. Just don't be silent and assume the outcome will be what you want. When I was in my young twenties, I was thrilled to be assigned to attend a big trade show in New York City. It was my first trip there, so I took the opportunity one afternoon to just wander around midtown Manhattan and take in the sights, sounds and (ugh) smells. It wasn't too long until I came upon a set of three or four people gathered around a guy who was playing with three cards on a little table. He was running a Three Card Monte game, and I had never seen anything like it. After watching for a while, I thought I had the game figured out, and felt "hey, maybe I could win a few bucks!" Fortunately, someone else was sucked in before me, and I watched him lose probably $100 before walking away. When I told the story to my savvy New York colleagues, they had a good chuckle at my expense, and I learned an important lesson. We're being similarly played by our lawmakers down in the Statehouse. Their game is "Hide the Taxes," and they're hoping they can "con" us into being the rubes. The Biennial Budget Bill they're working on right now contains a cut in personal income tax rates. If the proposed language makes it into law, there will an immediate change in the State Income Tax withholding tables used by employers, and everyone's take-home pay will increase a little. Voters usually like that sort of thing. But it doesn't mean our tax burden will go down. It's a little game of "hide the taxes." Find a recent property tax bill, and look at the green box in the lower right hand corner (this information can also be found on the website of the Franklin County Auditor). You'll see two lines, one labeled "10% Rollback" and one labeled "2 1/2% Rollback." These rollbacks - shown as negative numbers - are how the lawmakers decided to portray the property tax cuts for Ohio landowners. To keep the local governments whole, the lawmakers added an amount equal to the property tax cut to the funding each local government receives from the State. 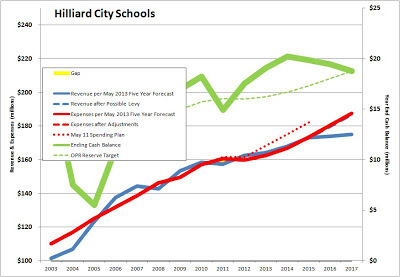 This is recorded in our Five Year Forecast as part of the amount in Line 1.050 "Property Tax Allocation." Line 1.050 is used to report money we receive from the State to replace revenue taken away by changes they make to property taxes. It includes not only the replacement for these two real estate property tax rollbacks, but also the cuts made during the Taft Administration to Tangible Personal Property Tax rates. For the fiscal year ending June 30, 2013, the total of these two categories of reimbursements is $17.4 million, of which $11.4 is for the real estate tax rollbacks, representing 7% of our total revenue. Here's the game: To offset the revenue reduction the State will see with a State Income Tax cut, our lawmakers plan to eliminate the 12.5% rollback on future property tax levies (ie no change will be made to the rollback/reimbursement for levies now in force). This change, like most changes to the tax code, creates winners and losers. When the Tangible Personal Property Tax on businesses was eliminated, the winners were the big manufacturers who have enormously expensive equipment and inventories. To offset that, the corporate income tax structure was changed. The net impact was to shift a great deal of the corporate tax burden from manufacturers to every other kind of business operating in the State. Under current law, if we pass a new school property tax levy that adds, for example, $100 per year to your property taxes, the 12.5% rollback would reduce that by $12.50 per year, and the school district would be reimbursed the $12.50 from the State. The State gets the money for that reimbursement from many sources, the primary one being personal income taxes. In other words, when this property tax rollback was implemented, it was funded largely with income taxes. Let's put aside for the moment any debate about whether our school district should be spending more money or less, and just envision that there might be a point in time in the future when the majority of us agree that more revenue is needed to operate our schools. If the determination is that $1 million/yr more is needed, then under current law, we could pass a levy that would generate $1 million/yr more, with $875,000 collected via our local property taxes, and $125,000 contributed by the State. With the proposed law eliminating the rollbacks, the whole $1 million/yr would have to be collected in local property taxes. So would you be a winner or a loser? The winners would be folks who have higher incomes and proportionately lower property values. Their income tax liability would drop more than the extra 12.5% property tax on new levies. Think of a middle-aged family still in their starter house even though their family income has gone up substantially in the years since they purchased their home. Folks who have high incomes and high property values, or low incomes and low property values probably come out even, with their income taxes going down about as much as the lost property tax rollbacks. Many of the losers will be retired folks, who bought and paid for nice homes during their working years, but now have much smaller incomes - a class which includes my wife and me. We would get little benefit from reductions in income tax rates, but would bear the full brunt of property tax increases. Little mystery as to why many of my friends who, upon retiring bailed out of Ohio and took up residence in states where there are much lower property and income taxes. The Carolinas and Florida seem to be popular destinations. With your permission, this November I will be seeking another term as a member of the Board of Education of Hilliard City Schools. 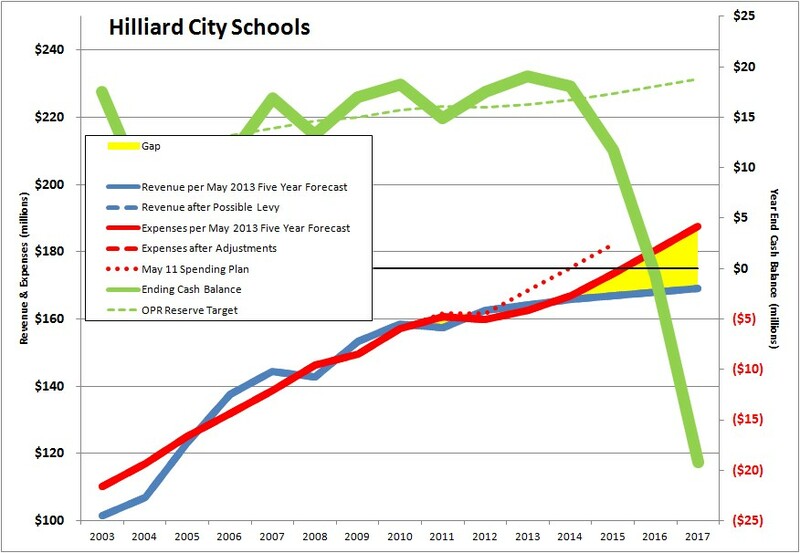 I believe our community has some challenging decisions to make about its public school district in the next 12 months, and I would like to play a role in the process - preferably from a seat at the Board table - representing the interests of those who appreciate how good Hilliard Schools are, but who also understand that the spending trajectory we are on cannot likely be sustained. Does that mean I am opposed to any and all future levies? No. As long as the delivery of education services is performed primarily by teachers who are in-person in the classroom, we're going to need a large number of professionals to fill those positions, plus the support and administrative teams to back them up. Those folks, like the rest of us, expect to have the opportunity to grow their compensation over time. We also should expect that our cost to provide benefits will rise at some rate which will be influenced both by what medical expenses are covered, and what goes on with the national healthcare debate. Unless something substantial changes about the way our district is funded by the State of Ohio, most of the additional money we will need to underwrite this growth in compensation and benefits costs will need to come from residential and commercial taxpayers in our own community. So every once in a while, we're going to need to pass a levy of some size. How often, and how large is what we need to talk about - community members and district employees together. Does that mean I think more taxes is the whole solution? No. I believe our rate of spending growth needs to be moderated. How much though, is a matter that needs to be addressed with a lot of community dialog. This will require that we take the time to better inform our community how school economics work so the discussion can be based on fact and reason, not simply emotion. This is the position I have held for nearly a decade, and you'll see it repeated over and over in this blog. Our spending - nearly 90% of it at least - is driven by compensation and benefits. In other words, how many people we employ, and what we pay them. If we're going to moderate the rate in which our spending grows, this is what we'll have to work on. The 'what we pay them' part is determined via collective bargaining with the union representing the teachers and other certified professionals, as well as the union representing the support staff. One hopes that when we go through this process later this year, it will take place with lots of empathy and reason - on both sides of the table. That's not what happened earlier this year in Strongsville, a Cleveland suburb much like Hilliard. It led to an teacher strike that lasted eight weeks, and has likely left scars that will take years to heal. The number of folks we employ is determined by factors such as the target student/teacher ratio, and the breadth of programming and services we choose to offer. As shown in the monthly Enrollment report, our elementary classrooms have an overall student/teacher ratio of 24. Although the Enrollment report doesn't show section sizes at the secondary level, data I have analyzed suggests the student/teacher ratio in our middle and high schools is lower - a consequence of the breadth of courses we offer. I think we need to have a conversation about that. First of all, because I love our community. My wife and I built our first house here 34 years ago, and stayed when we built our second/current home. We raised our kids here, and appreciate the quality of the education they received. I don't know for sure what our retirement years hold for us, but we have no plans to leave the area anytime soon. But we cannot long withstand the rate at which our property taxes have been growing. We, as a community, have a lot of work to do if we want to keep our community affordable while preserving the value of our property. 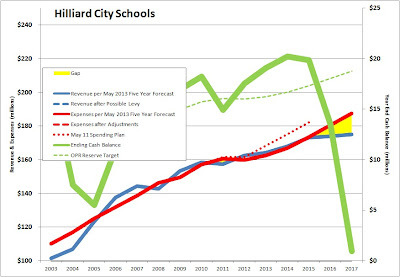 It's a tricky balance: the perceived quality of the schools drive up property values, while high taxes drive them down - particularly if there are other school districts in the region which are felt to offer better economics. I believe that after spending the better part of a decade trying to understand the economic and political dynamics which make our community tick, I am very well prepared to represent you on the School Board as our school district begins a new era under the leadership of Dr. John Marschhausen. If so, then I need your help with the first step: In order to have my name be placed on the ballot in November, I am required by the Board of Elections to collect 150 signatures on my Nominating Petition from registered voters who live in our school district. If you would be interested in signing, please let me know. Here are the documents provided to the School Board in connection with our upcoming meeting, to be held at 7pm on Monday June 10, 2013 at the Central Office Annex. Items F1 and F2 are temporary appropriations resolutions which are put in place until the permanent appropriations resolutions are brought before the Board in September, after the Treasurer has prepared the budget, in partnership with the Superintendent. F5 authorizes the Operations department to purchase ten new buses. This reflects a long-standing practice to replace 10% of our fleet every year, making the average age about five years, which helps keep the cost of operation low, and improves service reliability. Items F6-F8 are resolutions to approve updated Courses of Study for World Languages, Performing Arts, and Social Studies. I haven't read them through yet, but will be doing so this weekend. I encourage you to read them as well - this is what determines what your kids are taught in the classroom. I'll also be spending time with the proposed changes to policies, as enumerated in item G1.